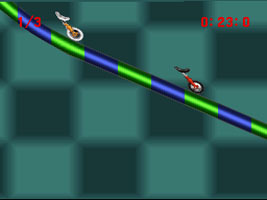 A unicycle racing game. Choose your unicycle and race against other unicycles to the goal line. Race along the large, winding tracks, looking out for obstacles that might slow you down, either completing laps or racing to the finish line ahead of your opponent. Perform stunts as you race in order to get speed boosts. 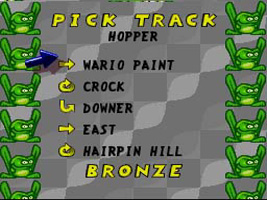 The "Wario Paint" track is named after Wario, Mario's greedy rival, and as a pun on the title of Mario Paint.